Antony Sweeney’s strike 18 minutes from time helped move Carlisle up to eighth after a 2-1 win at Leyton Orient last night. Derek Asamoah opened the scoring just after the hour mark after latching on to Gary Dicker’s through ball and slotting home. Mathieu Baudry headed the O’s level 2 minutes later but Sweeney struck home in the 72nd minute to leave Orient without a win in September. Orient remained unchanged from their 1-1 draw away at Northampton with Ollie Palmer continuing to partner Jay Simpson in attack with Paul McCallum awaiting news on his knee injury suffered at Sixfields. Carlisle who suffered a surprising 1-0 defeat at home to Newport on Saturday made 7 changes with only Michael Raynes, Mark Gillespie, Luke Joyce and Macaulay Gillesphey keeping their places. Derek Asamoah led the line for the away side in the absence of Jabo Ibehre. Carlisle started the brighter of the two sides, playing the ball around neatly in the opening stages. With their 3-4-1-1 system, Danny Grainger and Alexander McQueen were providing width for the away side as Carlisle looked to exploit Orient down the wings. Visiting center half Michael Raynes was urging his side to step up, squeezing play to prevent space for Orient to play in. The O’s were playing a narrow 4-4-2 system with Jack Payne looking to set the tempo for the home side in the heart of the midfield. Sammy Moore had the first effort of the night but his volley went safely into the arms of Mark Gillespie. Carlisle were looking to play out from the back and looked comfortable in possession whilst growing in confidence in the opening stages. Orient’s passing and tempo was slow and predictable allowing Carlisle to set up defensively and become hard to break down. Danny Grainger saw a free kick saved by Alex Cisak from an acute angle before Orient started to grow in the game. Ollie Palmer who is without a goal for Orient since 18th August should have opened the scoring on 20 minutes. Following a quick throw on the left, Fraser Shaw crossed for Palmer who had got across his man but his weak effort was easily saved by Gillespie. Sean Clohessy was once again providing an outlet down the right for the O’s but his final ball along with Orient’s in general was poor. The home side were looking for their first win since the end of August, were looking to create the opener and nearly took the lead on the half hour mark. Clohessy crossed from the right to the back post where Dean Cox headed into the path of Jay Simpson but Michael Raynes blocked Simpson’s effort on goal. Derek Asamoah was leading the line on his own for the away side but was providing a real outlet, utilising his pace in the channels. Asamoah’s run and shot created an opening but grazed the side netting of Cisak’s goal. With Orient continuing to have the lion share of possession, Keith Curle’s side were looking to hit the home side on the break with Orient shown a glimpse of the threat the away side possessed on 34 minutes. After a poor clearance from Mathieu Baudry, Sweeney fed Alexander McQueen on the right but his cross was put out for a corner. It was clear that Hendon had instructed his side much like Saturday to put a lot of crosses into the box however the majority of the them over hit or not to their intended target. But 8 minutes before the break Cox’s cross looked destined for the head of Simpson but Luke Joyce glanced the ball away from the frontman. The O’s were huffing and puffing in front of goal but late hero Dean Cox nearly provided another moment of magic 3 minutes before the interval. After good interchange down the left by the home side, the ball fell to Cox 30 yards out, Cox unleashed a fizzing swerving shot which left Gillespie beaten but cannoned of the bar. Orient started the brighter at the start of the second half and Cox nearly replicated his wonderful free kick on Saturday however this time his effort struck the bar. Hendon’s team talk seemed to do the desired job with Orient upping the tempo in possession and taking less touches on the ball. Moore saw an effort skip past the post after Simpson played in the former Wimbledon man. The O’s were well on top in the game and struck the woodwork for the third time, Jack Payne’s cross was headed towards goal by Palmer but his effort bounced off the post and to safety. Carlisle were beginning to sit deeper and deeper with Jack Payne dictating the play for the hosts as they searched for the opener. Simpson was next to go close for the hosts but he headed over a Sean Clohessy cross from the right. Despite being under the cosh, Carlisle still had the threat of Asamoah and his pace in attack and struck against the run of play just after the hour. Gary Dicker played a ball in the inside left channel, Asamoah had rolled Connor Essam creating space to allow him to slot beyond Cisak to open the scoring. Asamoah’s opener was the sixth game in a row Orient had conceded the first goal. Orient reacted well and responded 2 minutes later, following a training ground routine, 3 Orient men ran past the near post creating space behind them. Cox’s ball went over them and straight on to the head of skipper Mathieu Baudry who headed beyond Mark Gillespie to draw Orient level. With Orient look to push on from their equaliser, Carlisle manager Keith Curle and Orient’s assistant manager Andy Hessenhaler were sent to the stands following a tussle on the touchline. It appeared to distract the hosts more than the visitors, Carlisle saw the opportunity and struck again. Danny Grainger was allowed acres of space on the left hand side, his cross fell out to Antony Sweeney who saw his first effort blocked by Connor Essam. Essam’s block fell back to Sweeney who volleyed beyond Cisak to give Carlisle the lead once more. Blair Turgott was introduced after the goal for Sammy Moore as Orient searched for a second equaliser. Carlisle defended resolutely with Orient struggling to create any clear openings in the final 10 minutes. Orient’s last chance fell to Turgott who fired over from inside the box in stoppage time. Keith Curle had set up his side up well to contain Orient throughout the match however, it was another game where Orient should have taken the initiative to take all 3 points. The result leaves Orient without a win in their last 5 league games, picking up just 3 points from a possible 15. Is it time to worry? After a final start to the season with 5 wins from 5, expectation was going to be high, Orient were allowed space to play and create chances, something which visiting managers have since stopped. 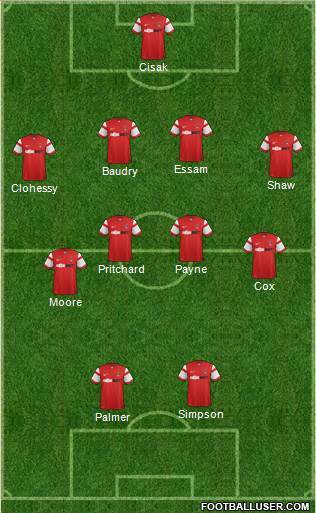 A problem which has seen Hendon have to change system from his preferred 4-4-2 diamond to a more conventional 4-4-2. It is important to say that Orient have only lost 2 out of 10 games but the worrying trend in recent weeks has been the failure to take chances when they have been created. “Goals change games”, “you have to take your chances”, “you create your own luck”, “poor defending will cost you” are all phrases which can be pinned to recent matches. Hendon stated post match to leytonorient.com “we are just not getting the rub of the green at the moment” perhaps you could suggest that from 1 or 2 matches but is it just bad luck for our results in September…. I think not, Hendon has his principles but Orient get into promising positions but lack the final ball or cutting edge at the moment. “on another day Hendon might have changed earlier with the diamond not working. I think we have seen a glimpse of what awaits Orient in a lot of games this year. Teams will look to sit deep when playing Orient especially when visiting Brisbane Road and currently Hendon’s side appear to unable to break down a resolute defense. It is clear that Hendon has changed tact from the opening games of the season but could we see a 4-4-2 with 2 wingers from the start of Saturday… A worry remains in the forward department, with McCallum set to be out for a long period of time, Orient only have 2 senior strikers in their squad in Simpson and Palmer. I think the importance for Hendon is to dip into the loan market to find a striker. One positive is the performances of Jack Payne who dictates play well for the O’s and looks to set the tempo when in possession. Orient will need to react well on Saturday against Notts County and it will once again not be an easy game. County will fancy their chances with Orient’s poor form and Orient’s defensive lapses will need to subside if they are to achieve a result at home. Orient are work in progress and the question to ask yourself is would you have taken 5th position after the first 10 games? Many will say, our form has dipped after the first 5 games but I think the quality of opposition has dramatically changed since the Bristol Rovers match. County will provide a real test but all we know is no matter how frustrating last night was, we all know we will back at Brisbane Road come 3 o clock Saturday afternoon.